Based on theories of regulatory compliance, this project seeks to investigate which of strategies by campaign enforcement agencies are most likely to encourage regulatees (candidates, contributors, parties and PACs) to obey the law. To begin to answer this question, we contacted state legislators in all fifty states. 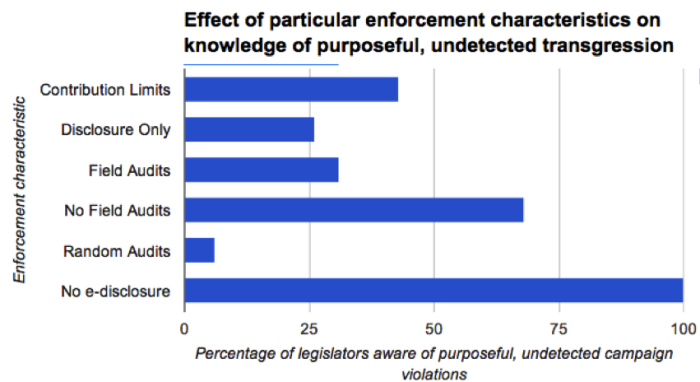 Legislators filled out a survey, responding to questions about the perceived efficacy of their state campaign agency, the merits of third party monitors, and the degree to which campaign finance law is violated in their states. We then analyze these survey responses with respect to known differences in state campaign finance regulatory enforcement practices. Todd Lochner teaches undergraduate courses in Constitutional Law, Civil Liberties, Introduction to American Politics, and Law, Lawyers and Society. He also teaches a joint undergraduate-law school course on Election Law at Northwestern School of Law, where he is a Research Fellow. He is Prelaw Advisor to the College, and his articles appear in Law & Policy, Regulation & Governance, Election Law Journal, and Justice System Journal, among others. He enjoys spending time with his wife Suzanna watching Game of Thrones and Modern Family. Ellen Seljan teaches courses on American politics, Congress, parties and interest groups, public policy, and research methods. Her research examines trends in public finance at the state and local levels of government. Her ongoing work analyzes the effects of fiscal institutions on state and local finances, as well as municipal tax capacity. She has published articles in State Politics and Policy Quarterly and the National Tax Journal. She previously taught at the University of South Carolina.